Provenance: Old Spink stock ticket in the hand of Douglas G. Liddell (1918/9-2003, see info below). Ex Stepengley/Steppingley Church Hoard, Bedfordshire, September 1912. 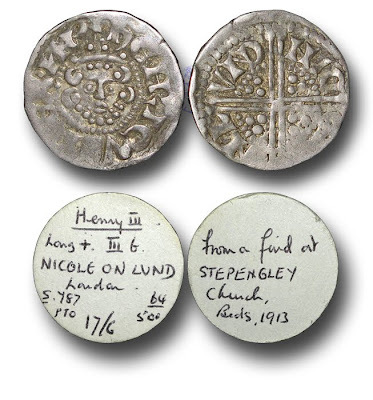 Hoard consisted of 518 coins (2 Short Cross, 485 Voided Long Cross, 13 Irish Voided Long Cross, 16 Scottish Voided Long Cross and Stars, 2 Lippe Sterling imitations), found in the Church of St. Lawrence at Steppingley, (Thompson Directory #342, also NC 1914). The church of St. Lawrence, rebuilt in 1860 by the Duke of Bedford and the rector, is a building of local sandstone in the Early Decorated and Perpendicular styles, consisting of chancel, nave, north aisle and a tower containing 4 bells : it is seated with open oak benches for 240 persons. The register dates from 1562, but is continuous only from 1647. 13th Century: The church consisted of a chancel, nave, north and south porches and west tower. It was said to be the smallest church in the county. The Gentleman's Magazine of 1849 said "it is probably the smallest in the county with a low tower not rising above the neighbouring hayricks." 1858-60: The east wall of the chancel collapses and brings down most of the church with it. The Duke of Bedford agreed to rebuild the church and commissioned Henry Clutton. Work began in December 1858 and the new church was opened on the 19th October 1860. 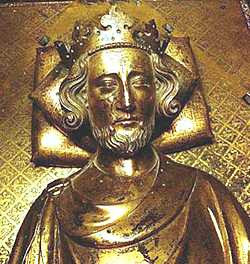 1912: During restoration work on the church a hoard of 13th century silver coins were found beneath the chancel floor. from: Lawrence, L.A. & Brooke, G.C. “The Steppingley Find of English Coins” Numismatic Chronicle 1914 (page. 60)[ full article pp. 60-76] This coin falls under types 231-258 listed in the catalogue of which there were six of this variety noted.